The Hero’s Journey is a literary narrative pattern that sees the story’s protagonist leave their hometown, embark on an adventure, overcome trials, and eventually return home a changed person. Most common in Greek mythology, the Hero’s Journey can be seen everywhere, from contemporary children’s movies (Finding Nemo) to pop culture phenomena (the Lord of the Rings and Star Wars) and even (in rare cases) outside the realm of fiction. Äli Kargoja’s life thus far has been one of those rare cases. Born and raised in Estonia’s capital city of Tallinn, she earned a law degree before deciding to pursue something less commonplace as a career. 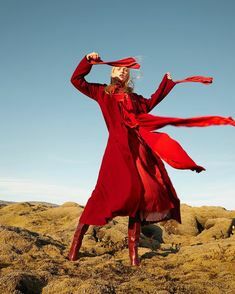 Kargoja’s call to action was heard when she was introduced to the fashion industry as a model, but it wasn’t until she was accepted into the fashion design program at Paris’ Studio Berçot that she decided to cross the threshold into the fantastical world of fashion. After passing all her tests, both academic and those posed to her by her mentors at Maison Martin Margiela and Nicolas Andreas Taralis, she was ready to return home. Now a changed woman, Kargoja opened her own minimalist atelier, August, with all the lessons she learned in Paris. With the tools necessary to take on textile and fashion issues in her community, Äli Kargoja is contently back in Estonia, determined to keep everything local from here on out. Do you remember falling in love with fashion? I can’t really point out a precise moment, life event or inspirational person that made me choose this path. I have been passionate about beautiful things since a very early age. It started out with making flower bouquets from everything that I could find from our back garden. There were no empty vases in our house for as long as I can remember. Flower bouquets escalated to making wooden jewelry, clothes for my dolls etc. I feel that I have naturally moved towards becoming/being a fashion designer. I guess I just had that creative side in me as long as I remember my existence. I have never given up on it and doing what I do now seems almost like a normal chain of events. I’m grateful everyday that I can wake up in the morning heading to do what I love the most. Who or what inspired the signature minimal aesthetic that we see in August? My love for minimal aesthetic goes back to my school years, when I was finding myself as a young designer. I find that simplicity expresses silently much more than the need to try and desperately stand out in a crown with how you look. It is all about the attitude and aura of a person that can only be supported with beautiful clothing. You were working for houses like Maison Martin Margiela before starting your own label. What motivated you to make that change and move from Paris to your home country of Estonia to do so? Studying in Paris was truly an eye-opening experience, as was everything I took in at Maison Martin Margiela and Nicolas Andreas Taralis. Prior to that, I had a passion for beautiful clothes but that was about it. I couldn’t imagine the amount of work that goes into creating a collection, starting from research until the final stiches. The long hours at the studios, the sweat, and the tears didn’t scare away my enthusiasm for creating something of my own. Moving back to Estonia after my studies and gaining experience at fashion houses was not a change, but the plan all along. I just wanted to be sure of what I was getting into. I haven’t regretted this choice so far and hopefully never will. I love the calmness of Estonia, there is enough space to think here. It suits me better than trying to concentrate in a city jungle. Last but not least – the production is much easier to organize here; I would like to keep it as local as possible. The factory we produce in now is situated few blocks away from us, so we are very hands on with everything going on during the production period with weekly quality check-ups. How would you say the label’s Estonian roots have influenced the design process? Estonia is still pretty well preserved when it comes to wild nature: endless forests, wild lakes, a beautiful seashore. I would draw a parallel to our brands love of organic and natural materials. And how do you see your professional design past working under huge fashion houses influencing what you’re doing with August? I think that the influence is subconsciously present everyday – the drive and the passion of the people I was lucky enough to work alongside reminds me in the hardest moments that impossible is nothing and there is a solution to every problem, no matter how difficult in may seem. For a small team like August, there is no other way than to be fully involved and be aware of everything that’s going on or not going on 24/7. I am in charge of the creative part of the process, but I also like to check the production to personally make sure all the details are coming along as planned. The identity behind August is to combine natural materials with contemporary design. Global Organic Textile Standard (GOTS) certified fabric mills, agents, and sustainable fabric fairs are the cornerstone of our fabric sourcing. Its important for us to keep challenging the fast fashion industry that is piling this planet with cheap, low-quality clothes and heavily polluting the planet in the process of making it as well as many other social problems (small salaries, the use of child labor, awful working conditions etc.). But there wouldn’t t be an offering without a demand, so we cant only point fingers at the fast fashion brands. There has to be a shift in the consumer behavior. That is a very long process. So even though we are a small voice in the huge industry, we would like to give the consumers at least a choice to consume consciously. How do you plan to continue providing such carefully made products as the company continues to grow? We stay true to our principle of keeping the production local. As the company continues to grow, so does the team, who all make sure to do their best to deliver high quality and mindfully made garments. We are currently in the process of expanding our retail range in Scandinavia and the Baltic States, mostly to concept stores and boutiques. 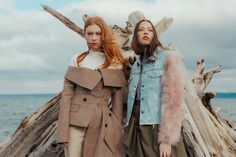 I think the style and concept of August would be appreciated especially in the Scandinavian countries, where ecological fashion and sustainability are highly valued. We are also working hard to expand with new product lines – like our first knits for SS17 collection.